Many may wonder what possessed Barb Hutchison to make Thoroughbred rescue her life mission, having not grown up around the industry. But for her, all it took was one look into the eyes of a slaughter-bound Thoroughbred at Fairmount Park to turn her whole world upside down. 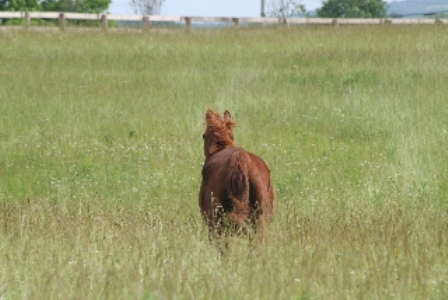 Renaissance Rescue, a 75-acre facility located south of St. Louis in Farmington, Mo., was founded by Hutchinson shortly after that encounter and has truly been a labor of love during its four years of existence. Hutchinson and her husband fund the majority of the facility out of their own pockets, as well as provide primary care for its 62 residents. Horse crazy as a young girl, Hutchinson rode Thoroughbreds on the show circuit for many years and was first exposed to racing as an adolescent during visits to Del Mar racetrack in California with her mother. 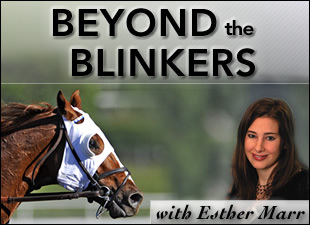 She didn’t come into contact with the ugly side of the sport, however, until becoming friends with Ginny Wood, a groom at Fairmount who gave her a behind-the-scenes glimpse of racetrack life. After getting Theresnogoodbye’s knee surgically repaired, Hutchinson decided to board him at her ranch, where he still resides today. She then told Wood to put the word out at Fairmount that she would pay owners a fee to rescue their horses from similar situations. Four years later, Hutchinson’s farm has nearly reached capacity with 62 residents. While Renaissance Rescue does have a few faithful volunteers, including Wood and Pat Maria Antonowitsch, who cleans stalls and helps with fundraising for the facility, Hutchinson performs most of the daily duties on her own. This leaves very little time for advertising horses for adoption, developing a website, or garnering funds to support the facility. In the future, Hutchinson hopes to gain more helping hands in order to ease her load. A couple years after Hutchinson founded Renaissance Rescue, Fairmount started a policy to ban any owner or trainer who knowingly sells to slaughterhouse buyers. 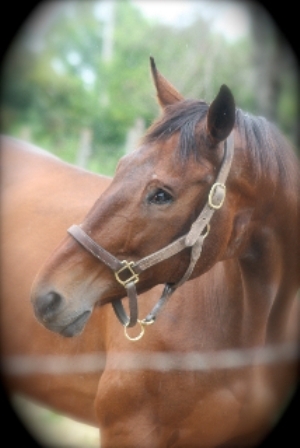 The track has supported finding homes for horses through the Racehorse Alternative Choice Environment program. 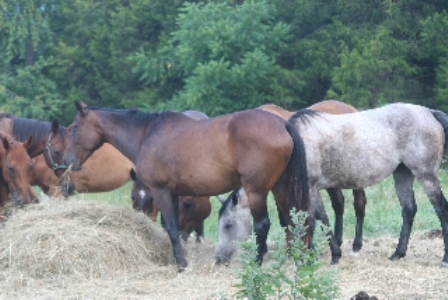 Most of the Renaissance Rescue horses have come from Fairmount, although some have been sent to the farm from other states such as Kentucky and New York. 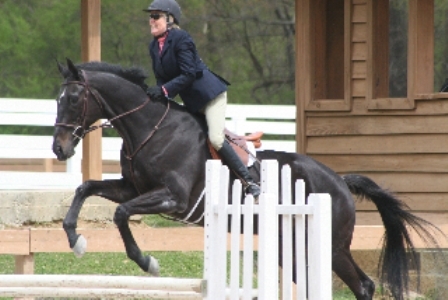 Hutchinson said she has always preferred Thoroughbreds to other breeds because of their intelligence and spirited personalities. While some of the Renaissance Rescue horses will live the rest of their days at the farm due to injuries, Hutchinson is in the process of retraining several others to have second careers as hunter/jumpers, trail horses, and pleasure horses. Many are available for adoption upon inquiry. Hutchinson said to her knowledge, Renaissance Rescue is the only other Thoroughbred retirement facility besides Old Friends near Midway, Ky. that accepts stallions. Hutchinson currently has one stallion, True Monarch, at the farm. She acquired the son of Maria’s Mon off the track at Fairmount after he had made 73 starts and earned more than $150,000. “He was having a little trouble breathing, was a little arthritic, and his owners wanted to retire him,” Hutchinson said. “They came and saw the ranch and asked if I could take him…they assured me he was very docile. He’s great; we don’t have any troubles with him." One of Hutchinson’s other farm favorites is Costello, a blind Thoroughbred ex-show horse that she used to ride in competitions. He now resides in a paddock alongside a blind Thoroughbred mare named Phyllis McKee who has become his lifelong companion. renaissancerescue@yahoo.com (Barb) or bettylou76w@aol.com (Ginny) or call 1.314.479.8858.